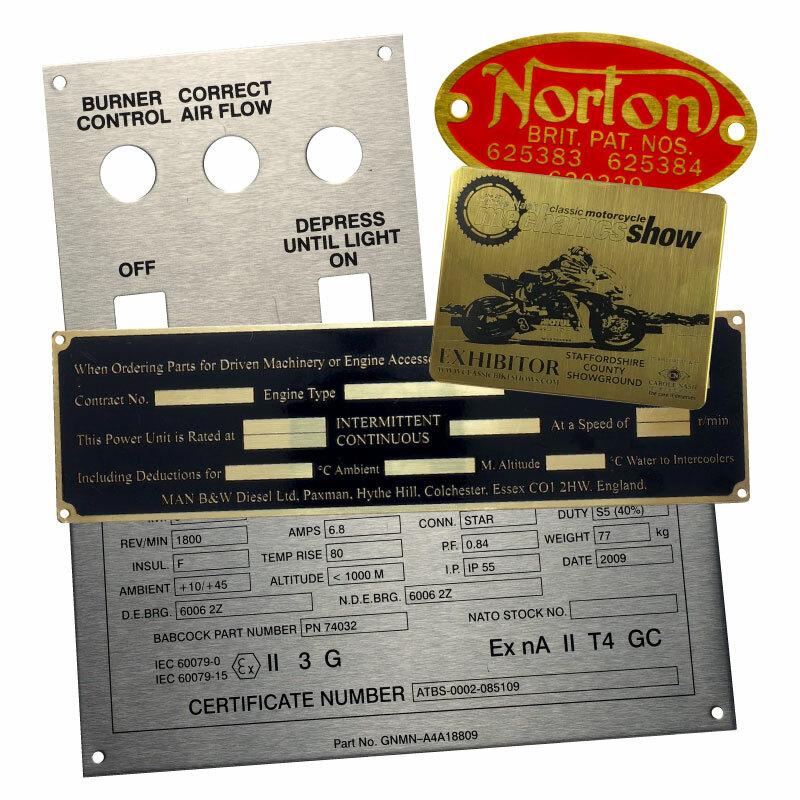 Chemical Etched Brass and Stainless Steel Labels, Nameplates, Plaques etc. Chemical Etching is a process where the image or background is chemically engraved (etched) into the surface of the metal using acid. This produces a sunken area on the surface of the plate; this recess is filled with stove enamel, which is then baked on for maximum durability. Whilst we can etch any metal, in practice, it is mainly Brass or Stainless Steel, which are employed for this process, as aluminium is normally anodised and dyed. (See details of Anodised Aluminium labels on our website). Chemically etched brass and Stainless Steel labels and nameplates are used in mining and other hazardous environments because the etching process ensures that the information is still legible even when the stove enamel has been destroyed, for example by fire or explosion. To ensure that your labels are produced to the highest standard, at the best possible price, we utilize the very latest computer controlled metal punching presses. Most standard fixing holes, radius corners etc. are available free of charge from our vast range of stock tooling. For special requirements, we can supply custom tooling at low cost. A range of medium and hi-performance pressure sensitive adhesives can be specified for coating onto the reverse side of your nameplates. They are supplied with an easy to remove release liner. The face side of the nameplate can also have a cleanly removable clear protective film applied, which will help to preserve the pristine appearance of your nameplates during manufacture or assembly of your product. The face film can also act as a paint spray mask. Chemical etching is often used for Registered Office plaques, which require a logo or crest with fine details, which would be difficult to achieve with machine engraving. Prestige Registered Office plaques are our speciality. For best effect, they can be mounted onto polished mahogany frames or plinths.